There are oodles of drive through Christmas Light shows on display around the Raleigh area at this time of year where from the warmth of your car you can enjoy musically accompanied decorations. 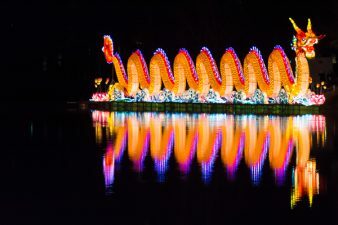 But once I saw the TV ads for the Chinese Lantern Festival I was determined to drag Storm on this walking tour in the freezing cold through a garden of luminous delight. Storm agreed reluctantly to accompany me though he was less than thrilled to be wandering around in the wintry dark trying to prevent frostbite on his fingertips. Thank goodness he is such a great sport because as you can see from the photos below, this was an unusual holiday event. Wow! Beautiful pictures, reminds me of the glow at ABQ balloon fiesta. I figured you and Sandy would appreciate the chance to see the show without venturing out into the cold. The good thing is that traffic was very light for the show (I guess because it was so cold) so we got in and out very quickly. I thought the whole display was gorgeous. You would have enjoyed the stroll with me!